In Apple’s October event that saw the launch of the technically giant’s latest software and gadgets, while iPads have been there in the limelight, taking the whole tech world by a big storm, they weren’t the only thing which Apple talked about. Apple announced the release dates and prices of its iPad Air and iPad mini with Retina Display and the latest version of desktop OS, the OS X Mavericks. So, here is all what you need to know about iPad Air, iPad mini Retina Display, and OS X Mavericks. Apple announced iPad Air, latest creation of its categories defining device, featuring an astonishing 9.7-inches Retina display in new lighter and thinner design. iPad Air is almost 20% thinner and 28% lighter than the 4th generation iPad, and having a narrower bezel, borders of this iPad Air are considerably thinner—making contents even more immersive. The new iPad features the power-efficient and powerful Apple’s designed A7 chip along with 64-bits desktop-class design, ultrafast wireless with expanded LTE phone connectivity and quicker incorporated Wi-Fi, and the recently-designed iOS 7 which features hundreds of superb new features. This new iPad with 9.7-inches Retina display weighs only one pound and also packs the unbelievable iOS 7 performances running on 64-bits desktop-class Apple’s A7 chip, and deliver whole day’s battery life in this full-sized, lightest tablet in the world. iPad Air with 43% narrower bezel makes the borders dramatically thinner. Its Retina display makes text, web pages, videos and images look incredibly realistic and sharp, and new power-proficient A7 chip lets its battery to be smaller, helping decrease its overall volume by almost 24% from previous generation though doubling its performance as well as maintaining its 10-hours battery life. A7 chip in the iPad Air with Retina display provides advanced graphics, 64-bits desktop-class architecture, and improved images signal processing from the previous generations. With almost twice the graphics and CPU performance on this, almost everything you execute is quicker and quite better than ever before, from launching the apps and editing photographs to playing the graphic-intensive games— everything while delivering full day battery’s life. A7 chip’s 64-bits architecture as well as support for the OpenGL ES version 3 unlocks game consoles-like visual effects. This new iPad also features M7 motion coprocessor which gathers data from gyroscope, accelerometer, and compass to divest work from A7 for enhanced power efficiency. This new iPad features two antennas to carry MIMO technology, delivering twice Wi-Fi performance at a blazingly quick data rate of almost 300 Mbps. The cellular models also are available with extended LTE coverage to hold more LTE networks globally, while continuing to distribute comprehensive support for the other quick cellular technology all over the world all in single model. This new iPad now has the next generation’s FaceTime High Definition camera with enhanced backside illumination sensor featuring bigger pixels for low-light, better performance. Its iSight camera having advanced optics and 5MP sensor, combined with the image signal processing’s of A7 and iOS 7, further improves still images and videos capture on iPad, thus bringing quicker auto-focus, better dynamic range, almost up to 3 times video zoom, 5 times still zoom, and automatic video and image stabilization. The new iPad comes with the iOS 7, featuring a striking new user interface, totally redesigned with elegant color palette, functional, distinct layers and slight motion which make it feel much more alive. The iOS 7 has lots of great new features, including Notification Center, Control Center, enhanced Photos, improved Multitasking, AirDrop, Siri, Safari, and also introduces iTunes Radio which is a free online radio service that is based on music you listen on iTunes. iPad clients have full access to revolutionary App Store that now present more than a million apps for iPhone, iPod touch and iPad users in almost155 countries all over the world, and around 475,000 apps or even more are designed especially for iPad. 60 billion apps or more have been downloaded till now from this App Store, which provides customers an unbelievable range of the apps in 24 different categories, including magazines and newspapers in Newsstand, entertainment and games, business, kids, education, news, sports, travel and health and fitness. iLife suite of inventive apps, including iMovie, iPhoto, and GarageBand, and iWork suite of efficiency apps, including Keynote, Numbers and Pages are vital to Apple’s experience and now are free with every iOS device which runs iOS 7, and also are available as free update for existing users, therefore more iPad users have access to such great apps now. All apps actually have been redesigned so as to match the feel and look of iOS 7, and consist of hundreds of latest features. Wi-Fi model of iPad Air will be available from Friday, November 1, in space gray or silver starting for suggested price of $499 for 16GB model, for $599 for 32GB model, for $699 for 64GB model and for $799 for 128GB model. And the Cellular + Wi-Fi iPad Air will be available from Friday, 1 November for suggested price of $629 for 16GB model, for $729 for 32GB model, for $829 for 64GB model and for $929 for 128GB model. New polyurethane, custom-designed Smart Covers will be obtainable for $39 in a variety of lively colors, including green, blue, pink, yellow, red and black. iPad Air’s Smart Cases are totally redesigned in a stunning aniline-dyed leather obtainable in six colors, including beige, yellow, blue, brown, red and black for a recommended price of $79 for iPad Air. Smart Cases and Smart Covers are available at Apple’s online store, selected Authorized Apple’s Resellers and Apple’s retail stores. iPad Air will be sold at the Apple’s retail stores, Apple’s online store, and through Sprint, AT&T, Verizon Wireless, T-Mobile, and selected Apple Authorized Resellers. Beginning from November 1, it will be available in the markets in the US, Belgium, Bulgaria, Australia, Austria, Canada, China (only Wi-Fi models), Czech Republic, Croatia, Cyprus, Finland, France, Denmark, Estonia, Hong Kong, Hungary, Germany, Greece, Italy, Iceland, Ireland, Japan, Luxembourg, Latvia, Liechtenstein, Lithuania, Macao (only Wi-Fi models), Montenegro, Macedonia, Netherlands, Norway, Puerto Rico, Poland, Portugal, Romania, Slovakia, Singapore, Slovenia, Spain, Switzerland Sweden, and the UK. 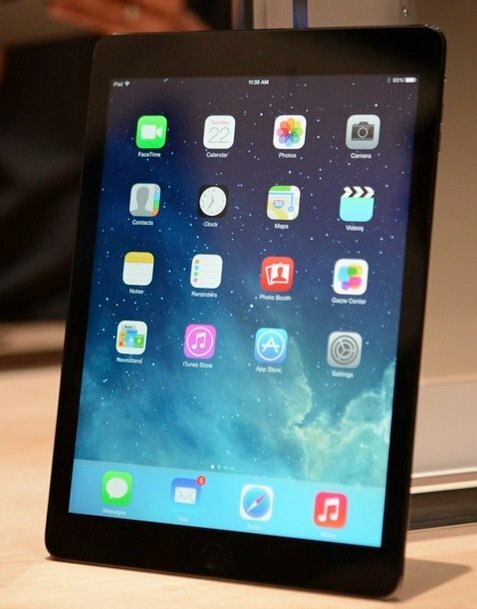 Apple unveiled its 2nd generation iPad mini, successor to the diminutive iPad it debuted last October. With much-improved screen, huge step up within processing power and connectivity, and improvement to the camera makes this iPad mini 2 Retina an incredibly improved tablet in comparison to the original one. Inevitably, Retina indeed has now made its own way to new iPad mini retina, and that perhaps makes the clearest difference to this tablet. Retina always has held a great power to astonish, making the like of iPhone 4 a deeply enhanced handset and arrival of this technology for updated iPad mini tends to be a key instant for this device. For aesthetes, photographers, or just those who like the display to be as clearer and crisp as possible, the advent of retina is immensely important. We loved iPad mini already but it seemed like it was always in holding pattern waiting really for a much better screen. This new iPad mini retina has become a very beautiful device, still handy, still well proportioned however now boasting the screen which is just fantastic. But to take benefit of new pixel-opaque screen, you’ll be paying up on last year’s Mini. Apple says the iPad Mini retina is 4 times quicker than last year model and has 8 times the graphics performance, though still providing an alleged 10 hours battery life. Not much has been changed in the terms of design or dimensions. Why mess with winning formula? But new iPad mini 2 having Retina display is slightly thicker than original mini, at about 7.5mm v/s 7.2mm. That’s clear. The iPad mini (Wi-Fi) with Retina display weigh 331g while Cellular + Wi-Fi model gain 29g over previous alike iPad mini. The iPad mini 2 with Retina display has same A7 chip which is inside new iPad Air also. That means it’s 64-bits device, which actually makes it much more future-proof. It also gets M7 motion coprocessor. And as usual, Apple provided no extra details like the quantity of RAM but it is of very little significance: the 2nd generation iPad mini bounds to live up onto Apple claims of being 4 times faster. The gamers should understand the fact that new mini is 8 times faster in graphics department, so the next-gen titles must play and look as much great as they will do on iPad Air. Alas there’s no big change in camera department, with 5Mp iSight snapper there on the rear and an enhanced FaceTime HD webcam there on the front – possibly the same unit which the iPhone 5C has. There’s good news in case you love to maintain vast libraries of photos, videos and music on your iPad since capacities range from the 16GB to the 128GB. And as always, it isn’t expandable. You get the dual-antenna Wi-Fi as well as support for MIMO that Apple says doubles theoretical transfer speed in comparison to original iPad mini. There’s Bluetooth 4.0 also and the cellular version only has GPS receiver as usual. In line with new iPhone 5s, iPad mini Retina display is now available in Space Grey or white. A new Smart Case and Smart Cover have been launched in numerous colors – both fit the new and old iPad mini models. However, in general except for the colors, new iPad mini really looks quite like its predecessor. Apple OS X Mavericks now is available for free of cost from Mac App Store. Just like last few Apple’s laptop and desktop operating system upgrades, OS X Mavericks smoothly slots in few hundred latest features, but doesn’t compel you to forget whatever you knew regarding OS X already or send you wild-goose chase for features which you used to actually rely on. At the first glance, the OS X 10.9 Mavericks looked similar to OS X 10.8’s Mountain Lion, with addition of an iBooks app and a Maps app that iPad and iPhone users had for years. However as you begin using it, you find out features which suddenly became much simpler to use—for instance, when any new-message notification comes into upper right of screen, you can then click on Reply button and directly answer from the notification, even without switching to Messages app. The new conveniences consist of optional background download of OS and some other updates, so that you spend lesser time clicking on Update buttons in App Store, and need to click only a notification button whenever the updates get downloaded and are ready to get installed. Small upgradings are everywhere—for instance, in Messages, you finally can delete individual messages there on your computer which you’ve been able always to do on iPhone. The most noticeable changes in OS X Mavericks tends to be the two latest apps, iBooks and Maps, both known to most of the OS X Mavericks users from iOS versions. Maps app, like you’d expect, is a very elegant alternative to the Google Maps, and in fact, Apple has ironed most, however not all the glitches which afflicted Maps when that was introduced for iOS. What makes the Maps stand out completely from Google Maps within OS X is tight integration with rest of the Apple’s apps. Hover on any street address in Contacts app, and the link appears presenting to show that address in Maps. And in Calendar app, whenever you create any event and type a location which OS X recognizes like an address, the map appears on panel with the details of event, complete with miniature weather description for the location. You can hover on an address in Mail message, and the map appears. As for iBooks app, this has few surprises in case you’ve used iOS version. Your bookmarks and notes all get saved into your iCloud account there, and the common layout is customizable and spacious. One integration attribute lets you copy passage from any iBooks book and then paste it in Mail message or any document, and citation is added automatically in form of Web link, but that link takes you directly to iTunes and only is useful on iOS or Mac device which has access to same book in the iBooks—it isn’t functional as any footnote in college paper, for instance.